Hi crafters! 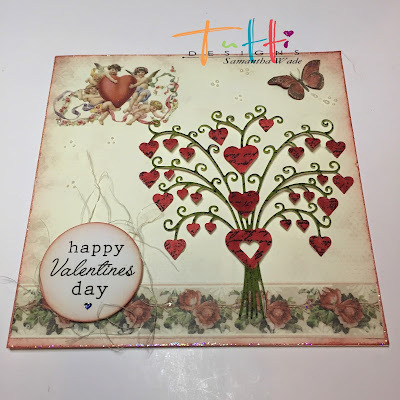 I am back today on the Tutti Designs blog sharing a card perfect for Valentines using Heart Garden. I used some teal and red paper to make a perfect Valentine card. Lovely Heart Bouquet for Valentines Day. Today is Lovely Heart Bouquet, TUTTI-207. Colour all the hearts red. Colour the rest Green. Then with a mat and ball tool give the Bouquet some shape. 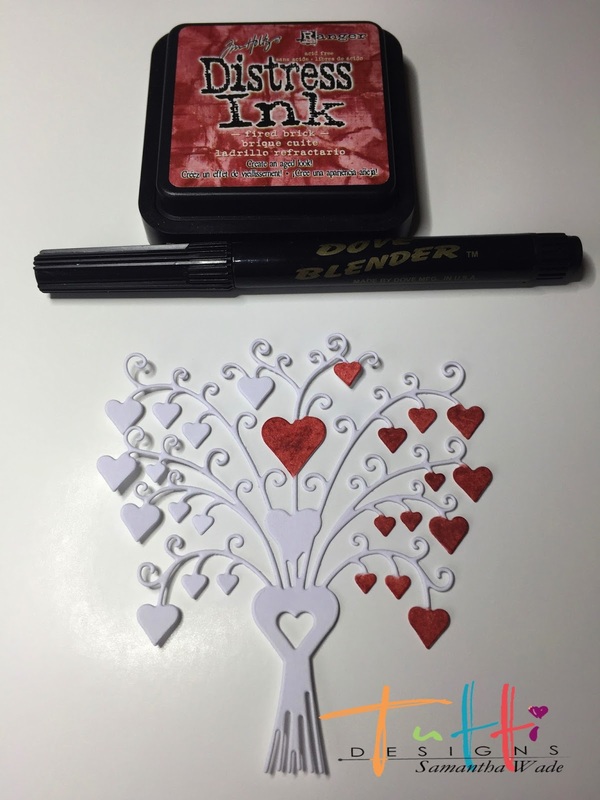 Then ink up a Prima text stamp and stamp onto the Bouquet. Make up the card with Valentines paper from Pion and a sentiment. but these dies can certainly be used for any wedding project. 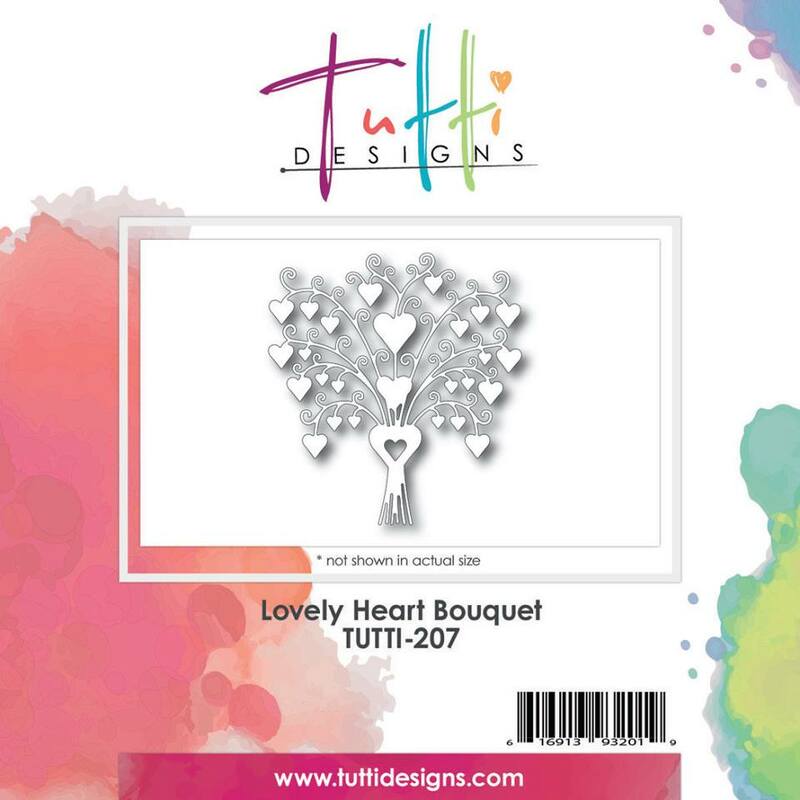 Valentines Day is a 2 short months away and these dies give you so many possibilities for any occasion, weddings and more. I simply added cut 2 die cuts. one from foil and one from white cardstock. 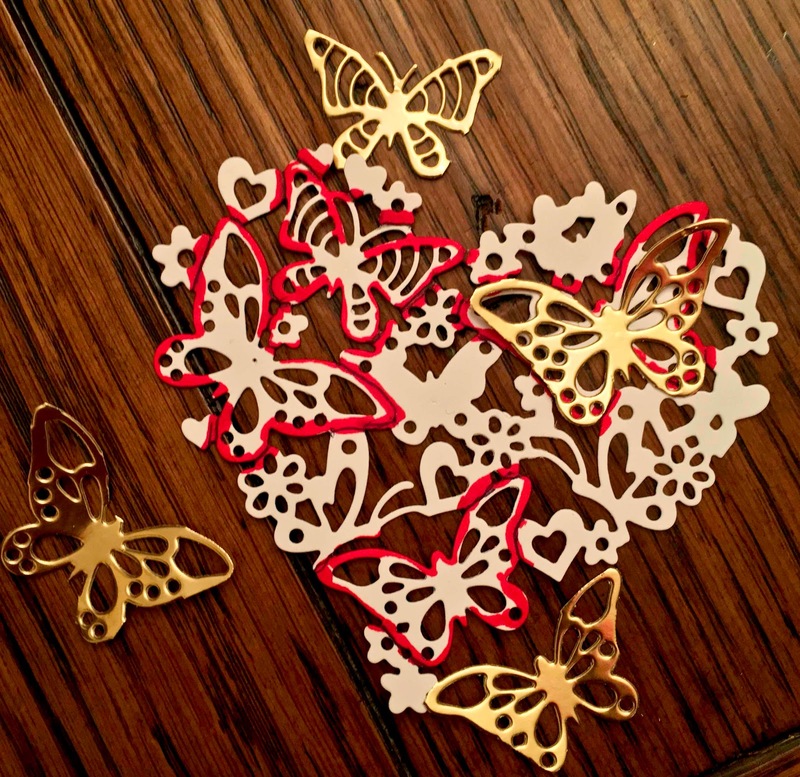 I die cut the Flowery Heart from Glitter paper, adhered them to a white background. It almost looks like a doily. 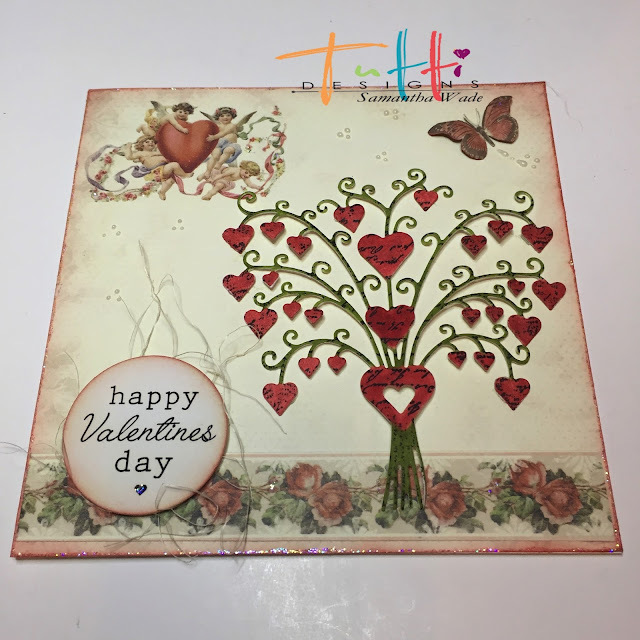 You can add your die cut sentiment to the front and to the inside. Autumn with you today to share a fun wintry mixed media project, featuring two of our newest dies, Hello and Nesting Stitched Squares. I used the square die to create a Polaroid frame to highlight portions of the stamping on my card. For those of you who are new to mixed media, let me share a very fun watercolor technique you can start with. 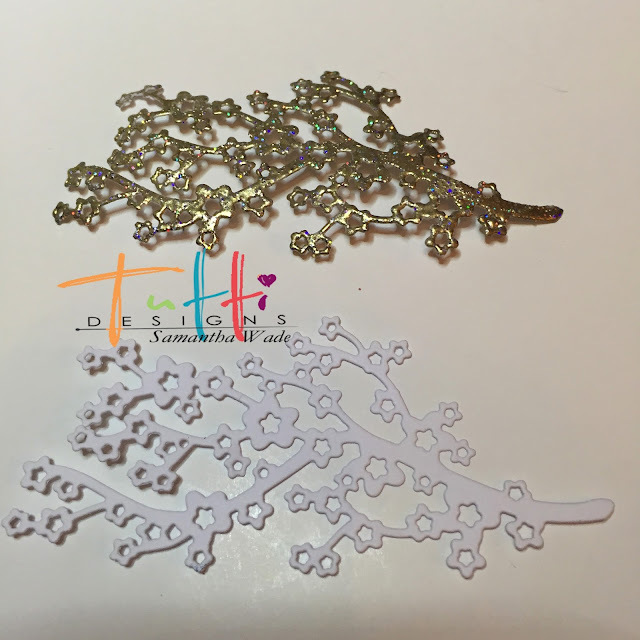 I started by embossing my stamped image, using the Stitched Square die as a guide for placement of my snowflakes. 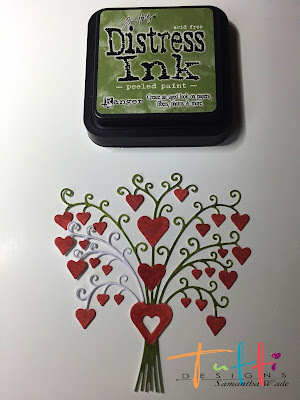 Next I used my acrylic stamping block to create an ink bath to stamp with. 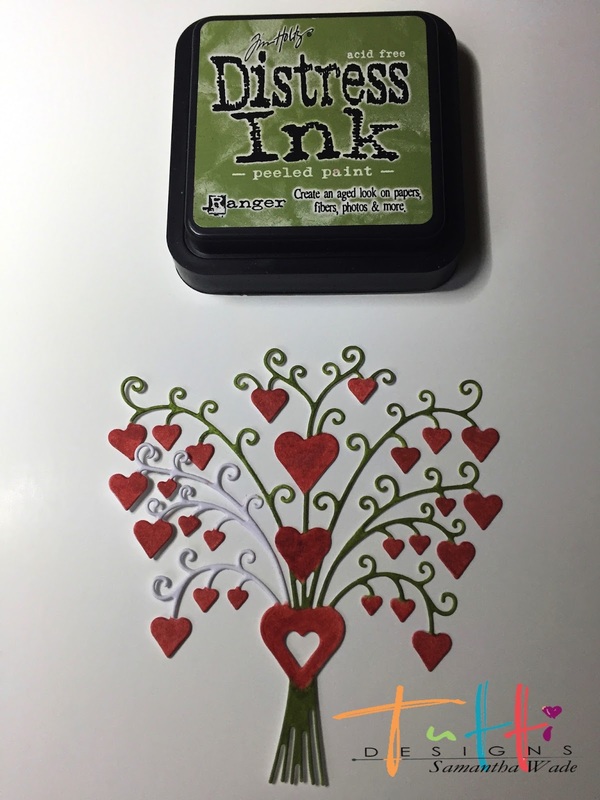 Simply, tap your block with Distress Ink and give a spritz of water. Most importantly, use a paintbrush to swirl the ink around. With the ink left on the brush, flick your paper and create more complexity. Stamp the ink repeatedly until it is all removed from the block. You get an idea of placement because of the clear block. Heat set lightly to dry and continue with additional colors, as desired. 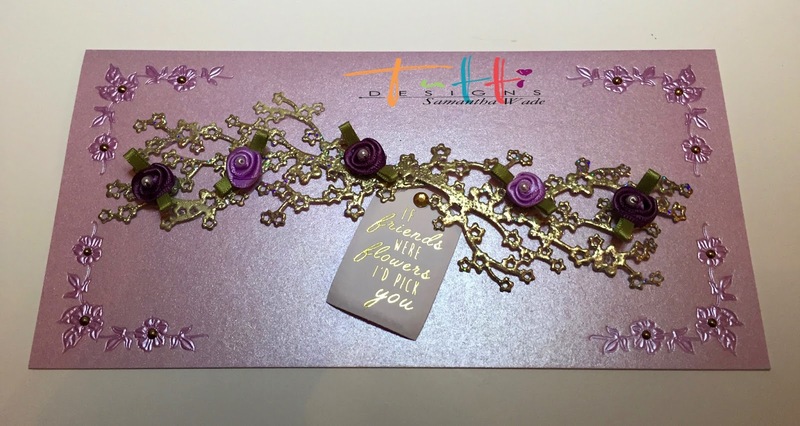 The embossing will pop through the watercolor background, creating a beautiful effect. To create the Polaroid frame, I simply cut a rectangle and used the Stitched Square die to cut out the center. I layered with a scrap of cheese cloth and added beads and sequins for drama. 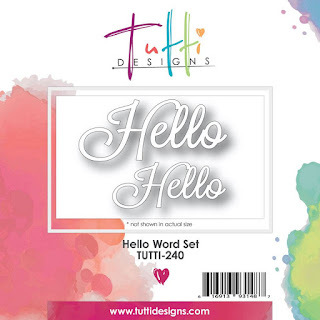 Grab your Hello Die Set today HERE! Tutti Designs dies, Swirly Hugs and Heart Garden. 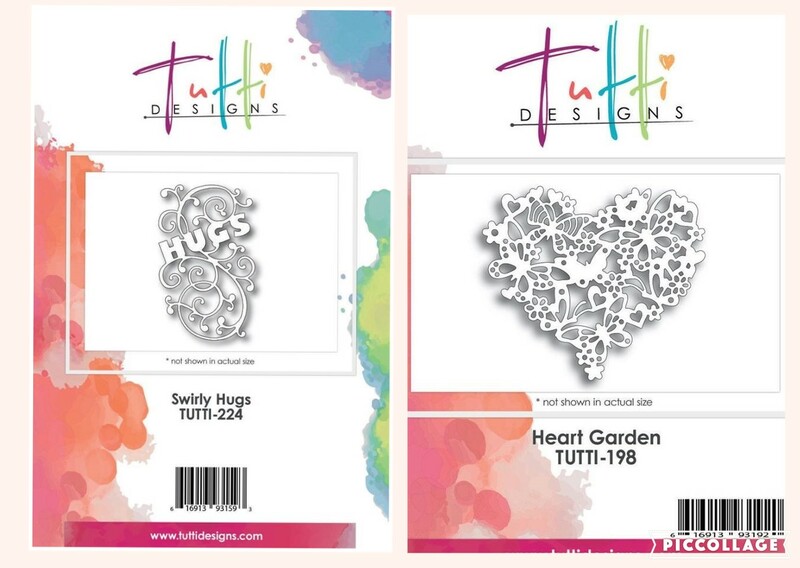 I just love the Tutti Designs new swirly word dies and gorgeous heart dies in the October and November new releases. I cut one Heart Garden die with gold metallic card stock and the other with white card stock. I colored the white die cut with Copic markers and added pink glitter glue to the hearts and 3mm flat back pearls to the center of the flowers. I cut a sample and outlined the butterflies in red for you that will be cut out from the gold metallic card stock and glued to the heart. 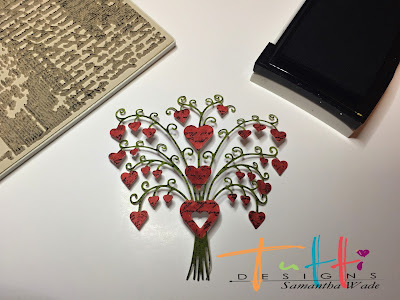 I added a yellow and white plaid scalloped heart behind the Heart Garden die cut to make this Heart Garden die cut stand out. 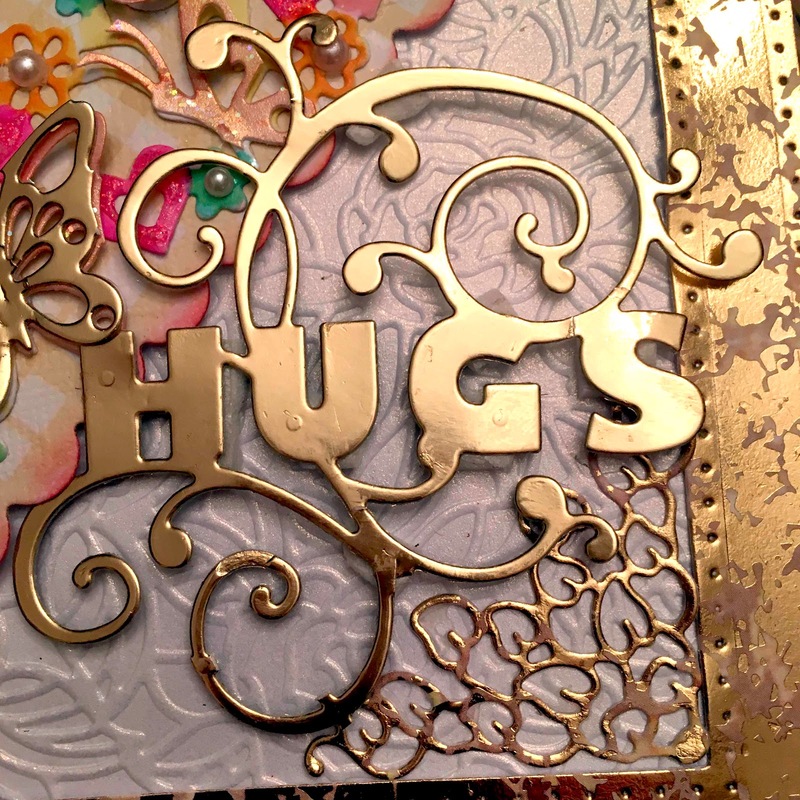 I cut the Swirling Hugs with gold card stock and cut part of the swirls to fit this on the card. 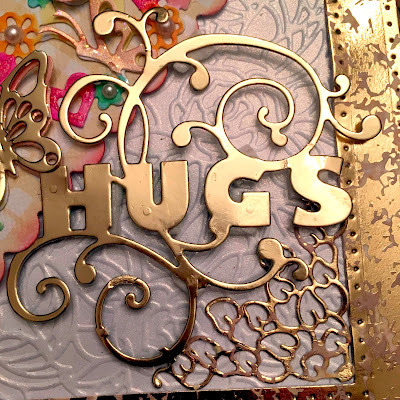 I embossed the white/gold shimmer card stock and added a square frame around the card. You'll want to be sure to pop over to the Tutti Designs Store and check out all the new November beautiful dies. 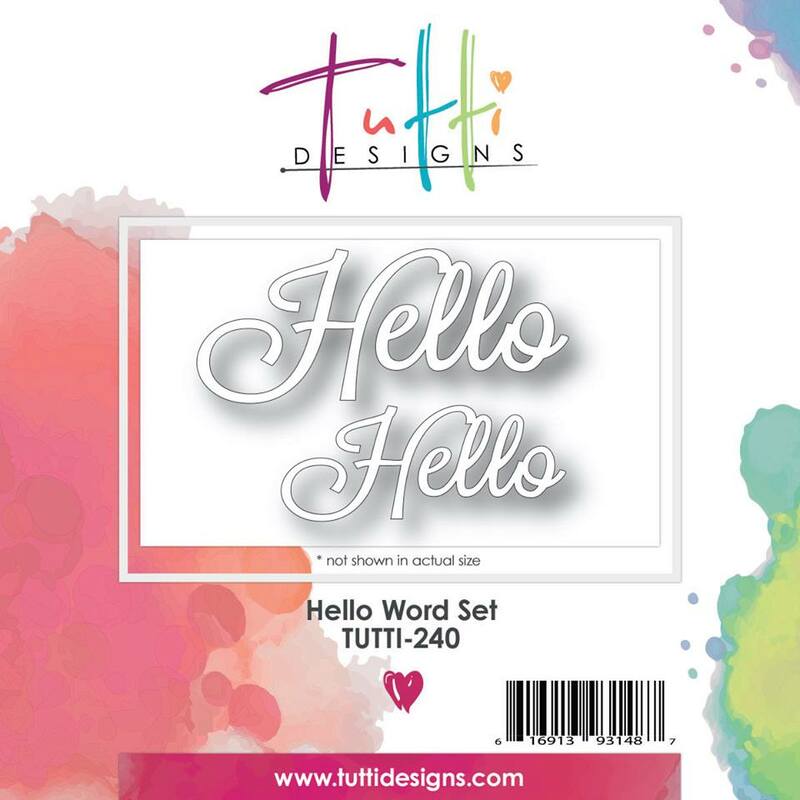 You can order these gorgeous dies from Tutti Designs on-line store or the wonderful stores and companies that carries Tutti Designs dies. which you can find right HERE. Christmas is over but as you can see this isn't really a Christmas tree. It's perfect for a masculine Winter card! I began with a black cardstock base. I cut the deer designer paper to size, and die-cut the tree from the center. Then I die-cut another tree from green cardstock. I simply adhered the green tree into the die-cut opening. The black behind the green displays all the detail beautifully! and a green cord bow. It would be lovely for any man having a Winter birthday! 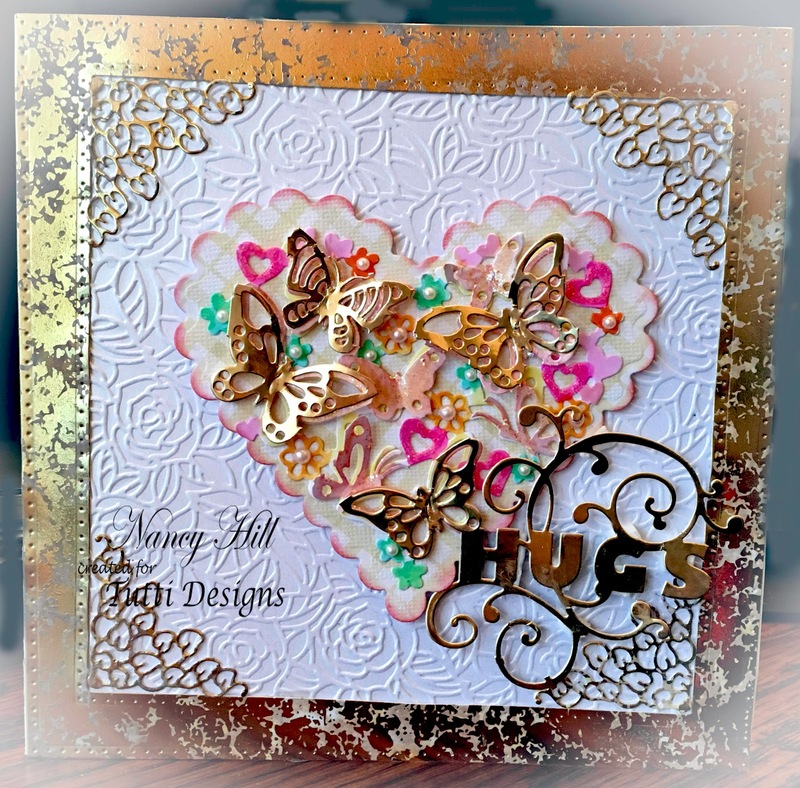 Darlene with you today and it's my turn to share a new, inspirational creation using dies from the Tutti Designs Store. 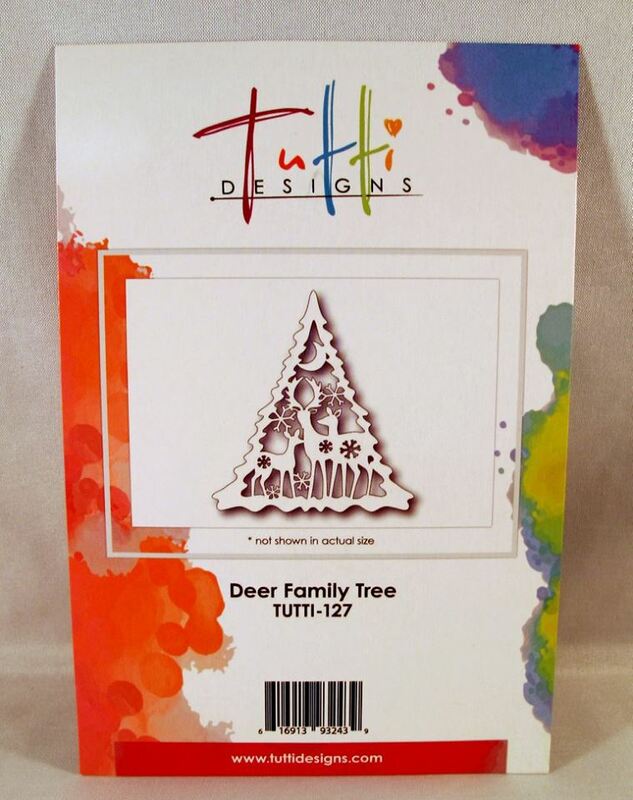 Tutti has released so many amazing dies recently but I decided to create today's card using a die from an earlier release. When is a better time to use your metallic and foil papers then now at the holidays! This fabulous die is so intricate and beautiful that I simply die cut from gold foil paper, positioned over a die cut oval matted in red and place on a decorate holiday design paper. A touch of red Stickles on the berries gave me that holiday sparkle finishing touch. Quick ... easy ... and just perfect! Today's I've appropriately used the Tutti Designs 'MERRY & BRIGHT' die - #TUTTI-128. die but in a different color scheme ... what do you think? to give it a more 'finished' look? 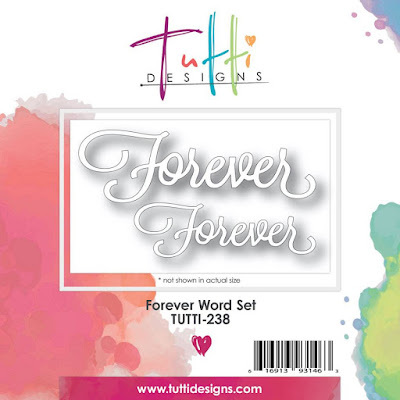 I'll be back again next Sunday with a new Tutti Designs project. a MERRY & BRIGHT holiday season! Hi all you love birds! 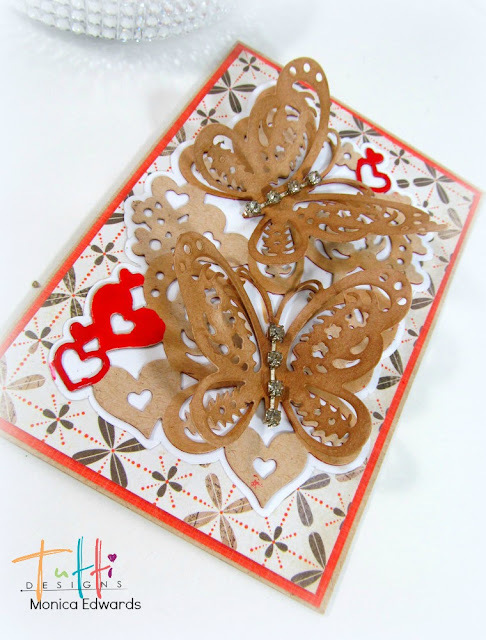 Team member Simply Monica here to share some love using "Love Butterfly Duo" TUTTI-203. 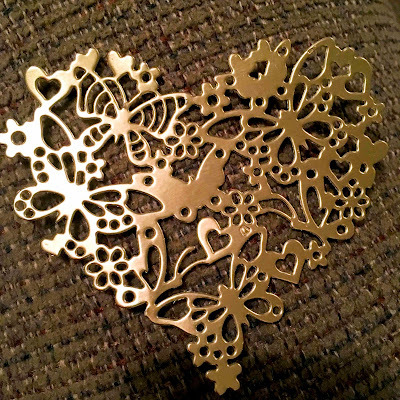 This gorgeous die has 2 intertwined butterflies surrounded by hearts. First I traced the outline of the die to serves as a background for the die-cut itself. Then I colored the paper using my copics just to give it some added color. For the card I used some patterned paper from My Minds Eye for my card. I then cut another layer but fussy cut the butterflies out so I could prop up their wings to make they appear as if they were in flight! For the body I took some rhinestone trim and adhered it to the centers. Metal Effect Cherry Blossom Branch. Today is Cherry Blossom Branch, TUTTI-177. Die cut the branch twice, from white card and pressed it into embossing ink, then sprinkled gold glitter embossing powder and heat set to create the metal look branches. Then with a mat and ball tool gave them shape. 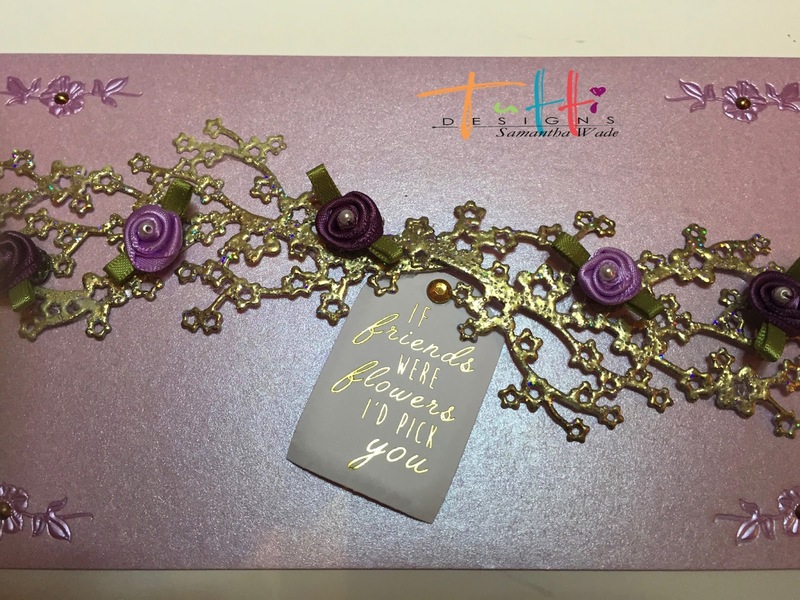 Glue and join the branches across the centre of the card. Add a sentiment and ribbon roses to finish. The branches are the perfect embellishment and they look like metal. 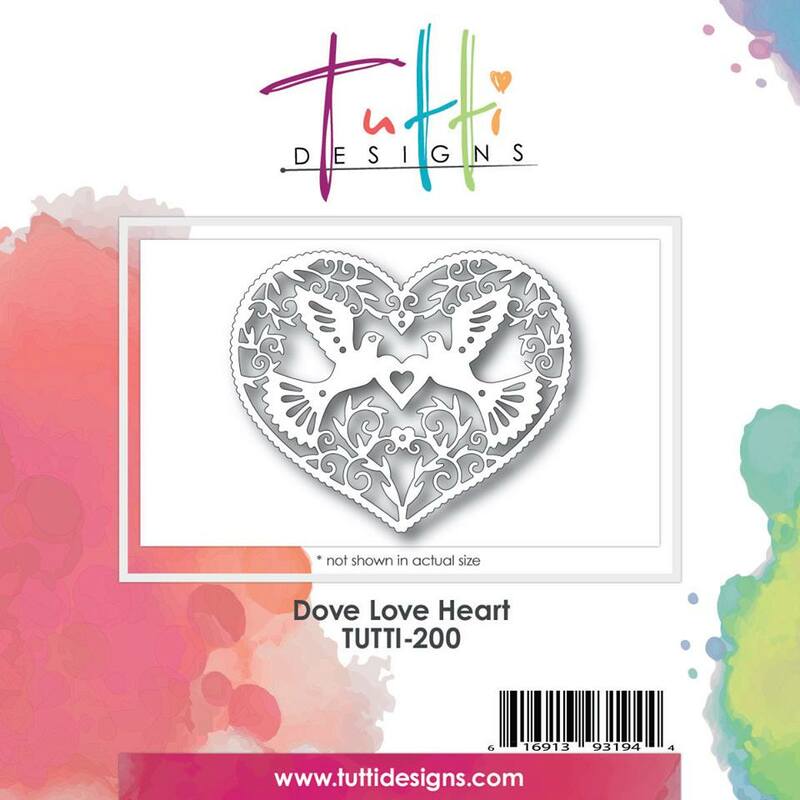 Happy Anniversary with Doves in Love. Happy Birthday, Love Heart Edge.